Overall Circuit: To get started, let's look at the schematic for this part of the Polysix. 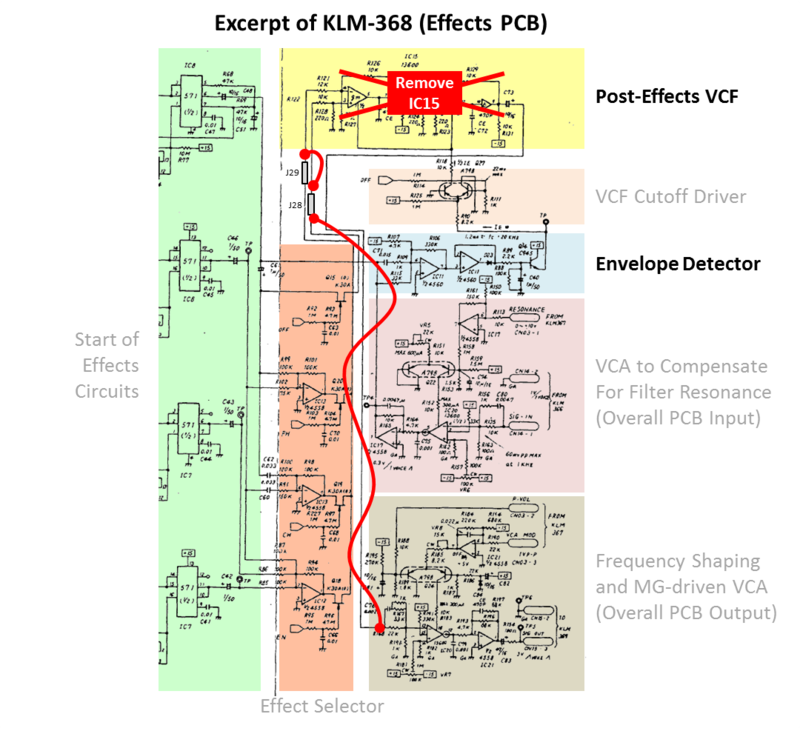 All of the elements that I'm going to discuss are on the KLM-368 "Effects" PCB. Below is an excerpt of this schematic with the different blocks labeled. The most relevant blocks are the VCF circuit itself (based on an LM13600) marked in yellow. 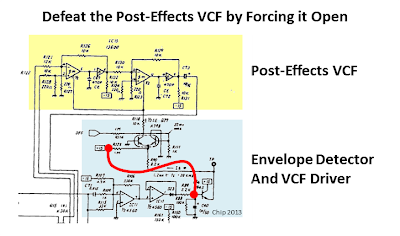 What drives the cutoff frequency of the VCF is an envelope detector circuit marked in blue. These two circuits work together to determine how much high frequency sound gets through the synth. A picture of this part of the synth is shown in the photograph below. The LM13600 at the heart of the VCF (ie, U15) is shown in the socket at the center of the photo. This will be the area for our modifications. 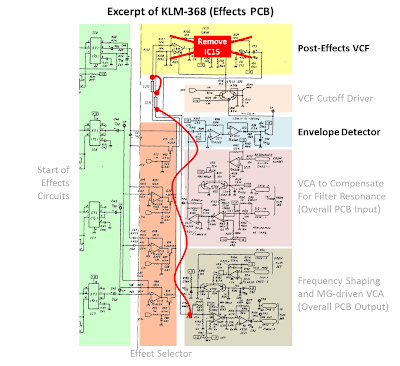 Picture of the Unmodified Circuit Around the Post-Effects VCF. Defeating the VCF: The first modification is the mod that I discussed very briefly at the end of my post linked above. I said that you could defeat the VCF by forcing it to be fully open all the time. You can do this by applying +15V to Q14. Q14 controls the current flowing through the filter, which controls the filter's cutoff. By applying +15V, you force the filter open as far as it will go. As shown in the schematic below, I do this mod non-destructively by using a clip lead to grab +15V from R125 and apply it to Q14 by clipping to R89. If you do this, make sure you get the correct side of R125 and R89. As shown in the picture below the schematic, you need to clip onto the bottom of R125 and of R89. By Jumping from R125 to R89, +15V is Applied to Q14, which Forces the VCF Open. 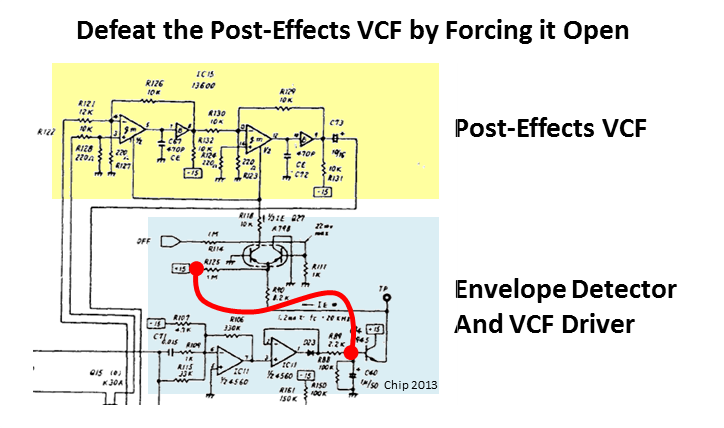 Using a Clip-Lead to Defeat the Post-Effects VCF by Forcing it Open. The Sound of Defeating the VCF: After adding this one clip lead, how does it sound compared to the stock Polysix? Well, in that soundcloud demo at the top, you clearly hear that muffled sound of the stock Polysix is removed and that the sizzling high-frequencies come through. To my ears, it's fantastic. If you like the more mellow sound of the stock Polysix, simply remove the clip lead. No harm was done! 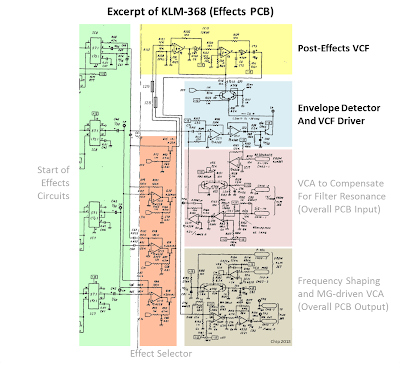 Permanently Removing the VCF: On the Polysix Yahoo Groups, there was a post by Tony of Oakley Sound who suggested that the best course would be to simply remove the VCF entirely. 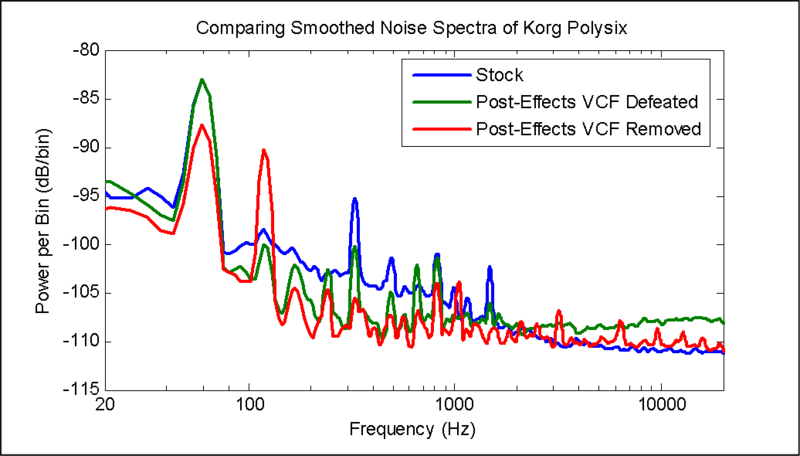 This would remove any noise contribution of the VCF and of its associated envelope follower. This is a fantastic idea. In his post, he discussed how to do the mod. Because it involved soldering and de-soldering components, it can make people nervous. So, instead, I propose a non-destructive version of his mod. Non-Destructive Removal of the VCF: As you can see in the photogrpahs so far, U15 (the LM13600) is socketed. This means that you can simply pop it out of the circuit without hurting anything (though do turn off the synth first). Removing U15 removes the VCF from the synth. Easy, eh? Pop U15 (an LM13600) from its Socket, and You've Removed the VCF! Reconnecting the Signal Path: Unfortunately, removing U15 also breaks the audio signal path, which means that you'll get no sound. That's not so nice. To fix this problem, Tony says you'll need to find J28 and J29, which are jumpers (ie, zero ohm resistors) that are not on the paper schematic. Once I found out where they were, I added them to my schematics, including the excerpts shown here. As you can see, they bring the dry audio signal (J28) and the effected audio signal (J29) to the VCF (U15). So, to reconnect the audio path, you can use a clip lead to connect J28 and J29 and then use a second clip lead to jump from either J28 or J29 (remember, they're now connected) all the way over to R168. As you can see in the schematic below, this jump to R168 brings the dry and effected audio down to the final VCA, which is also the overall output point from this PCB. As you can see in my picture below the schematic, be sure to connect to the left side of R168 (though it doesn't matter which side of J28 and J29 you clip to). To Non-Destructively Remove the VCF, Pop out U15 from its Socket, Clip J28 to J29, and Clip J28 to R168. The Empty Socket was U15. The Clip Lead Jumps J28 to R168. I still need to Jump J28 to J29. The Sound of the Removed VCF: After removing the VCF in this way, how does this sound? Well, in the simple demo at the top, it sounds much like my first mod -- it greatly increases high-frequency sizzling sound of the synth. 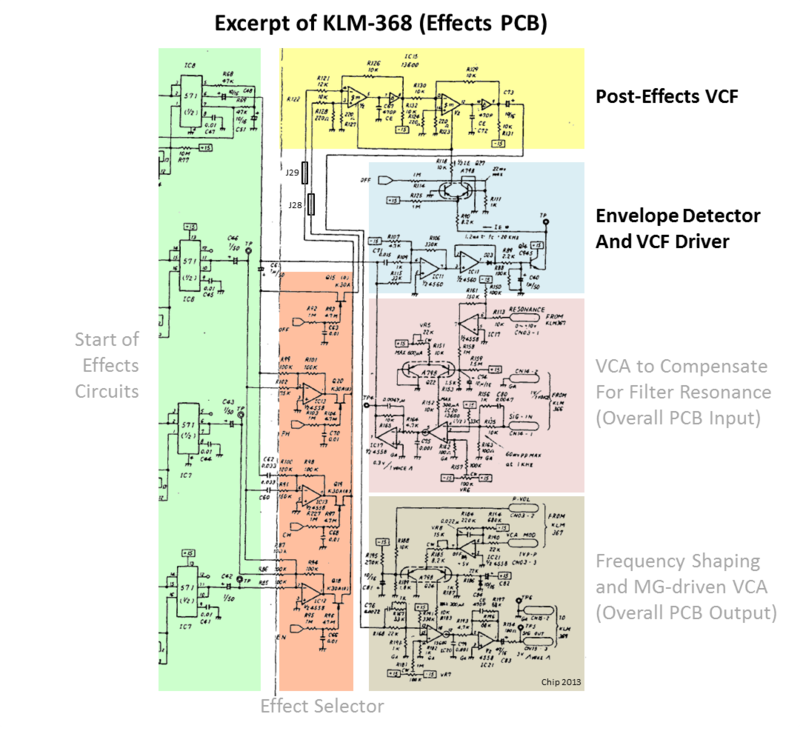 At first listen, removing the VCF doesn't really sound different from simply defeating the VCF. But, I have yet to play the synth at any length now that I've removed the VCF, so perhaps this mod will show its differences under other types of playing. I do like the idea of completely removing the VCF from the circuit. So I think that I'll keep this version of the mod, for now. Improved Attack Time: Besides increasing the high-frequency sizzle of the synth, defeating/removing this post-effects VCF also improves the synth's attack time. Sometimes the Polysix is criticized as having slow envelopes because the start of the notes can sound a bit soft. Since the per-voice envelopes are very snappy (~1 ms attack time), a little investigation shows that the problem is the slow response of the post-effects VCF. The graphs below show the start of a high-pitched note output by the Polysix when in its stock configuration (top graph), with the VCF defeated via +15V at Q14 (middle graph) and with the VCF removed via removal of U15 (bottom graph). Along the bottom is the time in seconds. Attack of a High-Pitched Note. (Top) Stock Polysix. (Middle) Defeated Post-Effects VCF. (Bottom) Removed Post-Effects VCF. As you can see in the top graph, the stock Polysix can take about 10 ms for the sawtooth amplitude to reach maximum (though it does get within 3 dB within of 3 ms). By contrast, defeating VCF (middle graph) or removing the VCF (bottom graph) allows the sawtooth to reach its maximum in less than 1 ms. The snappy sound is back! Furthermore, look at how sharp-edged the sawtooth is in the bottom two graphs versus how rounded it is in the top graph. This is a visual illustration of how the VCF is muffling the very high frequencies of the Polysix. First, let's ignore all the spikes in these graphs. 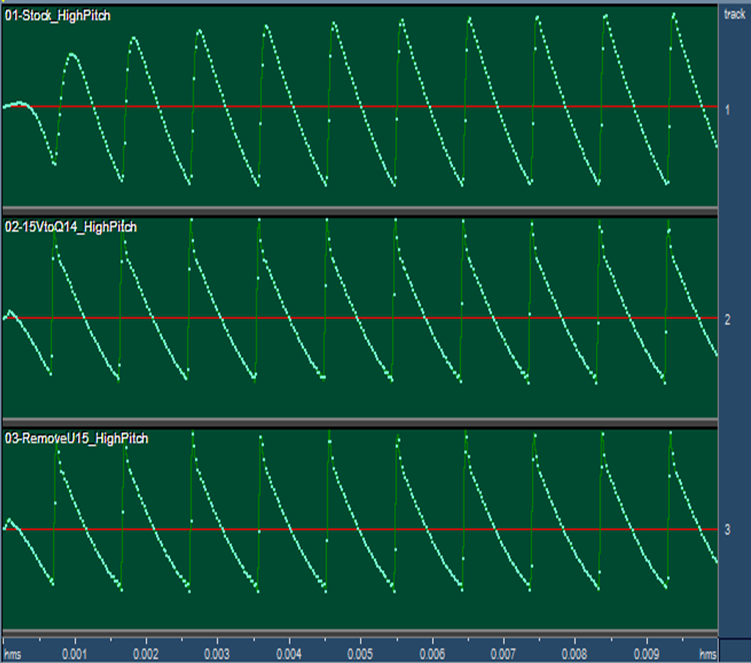 Most seem to be due to line noise (60Hz) and its harmonics. 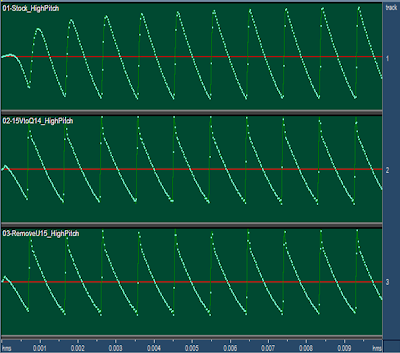 Different configurations look different at the different spikes, but none of them is clearly superior. So, instead, let's ignore the spikes look more broadly. What I see is that the stock Polysix (blue) has the worst noise of the three configurations for the frequencies from 100 Hz out to about 1000 Hz. 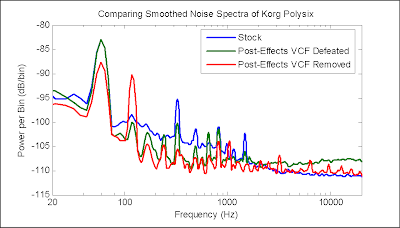 Defeating or removing the post-effects VCF seems to lower the noise level in these frequencies. That's great! Above about 2000 Hz, though, we see that the green line is the worst. The green line is the case where I defeat the VCF by forcing it to be open all the time. This condition is about 2-3 dB noisier than the other two cases. Because this vintage synth only has a signal-to-noise ratio of ~45 dB to start with, loosing another 2-3 dB is definitely noticeable. Conclusion: Overall, I'd say that the red line is the best. This is the case where the post-effects VCF is removed by pulling U15 and jumpering J28/J29 over to R168. It shows the lowest noise in all frequency bands, with the exception of the spike at 120 Hz. If you can live with that, you get decently low noise everywhere else, you get the full high-frequency sizzling sound available from the Polysix, and you get the fastest attack for each of your notes. It's a winner. And, it's fully-reversible if you decide you don't like it! Update: Is this modification now too bright? Try removing Korg's own attempt to brighten the synth! Update: Want to make the mod more robust? Try soldering a jumper wire instead of using the clip lead! I say we baptize it: "The Chip Mod"
And mainly.. THANKS FOR SHARING! Thanks for the kind words. While I did come up with the idea to force the filter open via Q14, it was Tony of Oakley Sound who had the audacity to suggest that it actually get removed and who suggested the jumpers J28 and J29. I then took his ideas and re-formulated them as a non-destructive mod. It's an example of the great things that happen through the free sharing of ideas. Any mod improving attack time is very valuable. Way to go on the investigation and filed testing, Chip. This makes it sound 100% better to me, I ended up soldering in a wire after testing. Thanks! Hi Chip! Great jobs on the analysis and documentation of the effects section of the P6!! I decided to try it today. I ended up performing the bypass you describe. However, I also replaced all electrolytic caps. For the signal path caps, I used audio-grade type. I also replaced all four ICs in the signal path (with quality gold plated sockets) and used high performance audio-grade op-amps (LM4562NA). And last, I removed C76 (as to disconnect the high freq. factory compensation rework/mod). The result is amazing!! thanks man. polysix now sounds better than ever. I would suggest another Mod. It's possible to increase the gain of the first stage of IC11 by increasing the Resistor Value of R106. You could even put a 500K Variable Resistor in series with the original 330K R106 and mount it to the Front Panel. That way you could keep the original character of the polysix by simply leaving the Variable Resistor at Zero Ohms or dialing it up to 500K for more 'Sizzle' when required!